Long duration energy storage offers “value-add economics” for microgrids and renewables integrations, according to a recent report from Lux Research. 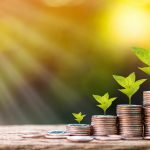 The research and advisory services firm modeled the cost of deploying different technologies for long duration energy storage for five key services: peaker plant replacement, renewables integration, microgrid energy storage systems, renewable energy backup, and seasonal energy storage. The resulting map shows the lowest-cost energy storage technology for each use case. The increasing deployment of renewable energy is fueling the demand for energy storage. “Greater renewable penetration on the grid means longer duration storage is necessary to start to combat some of the issues that are caused by non-dispatchable generation assets,” explained Grejtak. The interest in flow batteries is rising for longer durations and larger system sizes. These batteries store energy in liquid, typically vanadium ions, rather than solid chemicals like lead or lithium ions. They scale up more easily than solid chemical batteries, facilitating lower costs for large electrical systems like wind farms. In countries like Indonesia, Madagascar and the Philippines, there is a drive to provide electricity to customers who have never had access to it. A quick and cheap way to achieve this is with solar microgrids that use long duration energy storage. The Lux Research team recommends focusing on the lifetime costs for long duration energy storage, rather than only the upfront capital cost. The lifetime costs include efficiency, replacement, and operation and maintenance. Modeling the costs for a solar plus long duration energy storage microgrid, with zinc-air batteries, result in electricity costs below those from diesel generation. Choosing the right battery technology starts with assessing the application and requirements it has to meet. The Lux Research analysis shows that zinc-air is a well-suited chemistry for microgrids, providing a cheap energy storage solution. Flow batteries struggle to scale down to the size of a typical microgrid, and lithium-ion batteries do not compete on cost. “Zinc-air is a hard chemistry to get right, but for those that can, there’s a really great opportunity for microgrids,” Grejtak said. Flywheels, liquid or compressed air, pumped hydro and hydrogen do not easily scale down for microgrids, but could be well-suited for utility scale applications, according to Lux. Getting the battery technology right is important, but installing suitable software helps to future proof the microgrid. For rural electrification projects in Africa and Southeast Asia, there may be aspirations to connect onto a future grid. This can increase the value of the microgrid, even if it is competing against grid electricity. “The way you can do that is by providing additional services, not just power, but ancillary services like voltage support or frequency regulation to the grid. Software will help enable that,” Grejtak said. Back in the US, regulators increasingly allow energy storage to perform in more diverse ways, providing demand response, ancillary services and capacity for the grid. Long duration systems that can provide bulk energy management solutions as well as more focused power applications could stand to benefit from this, driving down the cost of energy storage as a service. Track news about long duration energy storage. 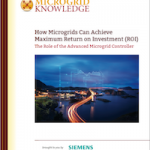 Follow Microgrid Knowledge on Twitter @MicrogridNews. Long-Term Energy Storage: What are the Options When Lithium-ion Falls Short? “Flow batteries struggle to scale down to the size of a typical microgrid, and lithium-ion batteries do not compete on cost.” This statement is quite relative to what is meant by “the size of the typical microgrid”, which is not qualified in the article. According to my frame of reference, the statement is misleading. 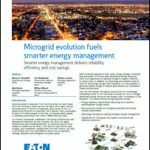 According to the energypedia, “They involve small-scale electricity generation (10 kW to 10MW) which serves a limited number of consumers via a distribution grid that can operate in isolation from national electricity transmission networks.” However, it seems that the majority of microgrid applications, e.g. for remote communities in Africa (my energy storage focus area), will be in the order of 50kW and upwards and the flow battery that I am promoting, starts off at 50kW/400kWh with a very low Levelised Cost of Storage, while it is so much safer and easier to operate, especially at high ambient temperatures, than Lithium batteries.